I will have 30 years of service credit with my employer of July 1, 2016. My question is can I retire any day after July 1, 2016? Assuming you’re in a regular retirement plan, you can apply for retirement any time after you reach age 55. Once you have 30 years of service credit before you reach the age of 62, you can retire without a benefit reduction. You should confirm the date you’ll have 30 years of service credit by submitting a Request for Estimate form (RS6030). On the form, explain that you want an estimate based on the date you will have 30 years of service credit. I will have 30 years of service credit as a NYS Corrections Officer (Tier 3) in 2019, however, I will be 51 years old. Will I be able to retire without a benefit reduction or will I have to wait until I turn 55 years old to retire? Are there any benefits if I continue to work longer than age 55? 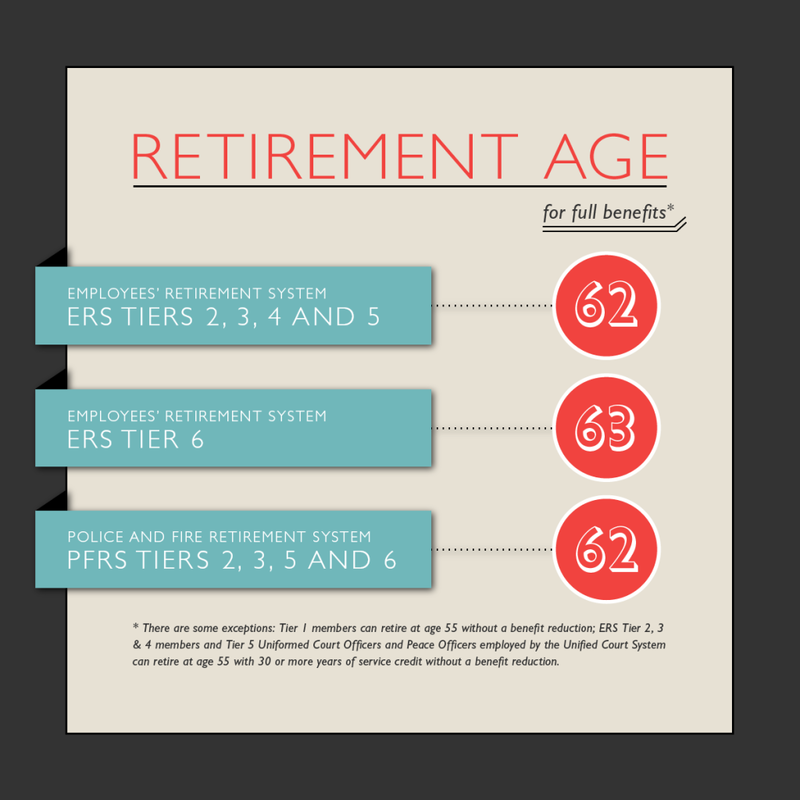 Assuming you are covered under the Article 14 Corrections Officer plan, with 25 years of creditable Corrections service, you may retire at any age with full benefits (one-half of your final average salary [FAS]). Does any sick time accrued add to your service credit length? If I will have 30 years in August and I have three months’ worth of sick leave credit, can I retire in May and still effectively have 30 years’ credit? If your employer provides the sick leave benefit (Section 41(j) of the Retirement and Social Security Law), you may receive additional service credit for your unused, unpaid sick leave at retirement. However, you cannot use this additional credit to qualify for better retirement benefit calculation or reach a milestone. If you are a Tier 2, 3, or 4 member retiring before age 62 and need 30 years of service credit to retire without a benefit reduction, you would need to earn the 30 years of service first. Then, if your employer offers the sick leave benefit, you can receive the additional time toward your retirement benefit calculation. How much of unused “VACATION” payout, if any can be applied to a tier 4 member’s FAS? Tier 4 members can use up to 30 days of vacation pay towards their FAS calculation as long as their last three consecutive years are the highest. There are limitations though. For Tier 4 members, each year of your FAS cannot be more than 10% higher than the average of the previous two years. Any earnings above the limit will not be used in your pension calculation. For more information, or information about other tiers, please visit our Final Average Salary page or find your retirement plan booklet on our Publications page. you stated at the beginning of this entry that “you cannot use this additional credit to qualify for better retirement benefit calculation” but at the end you state that “you can receive the additional time toward your retirement benefit calculation”. can you clarify this please. ·	Qualify for vesting. For example, if you have four years and ten months of service credit and you need five years to be vested, your sick leave credit cannot be used to make you vested. ·	Qualify for a better retirement benefit calculation. For example, if you have 19½ years of service credit but your pension calculation will improve substantially if you have 20 years, your sick leave credit cannot be used to get the better calculation. ·	Increase your pension beyond the maximum amount payable under your retirement plan. ·	Meet the service credit requirement to retire under a special 20- or 25-year plan. Check out the Additional Service Credit for Sick Leave section in your plan booklet, which is available on our Publications page. If you have questions about your specific circumstances, we recommend emailing our customer service representatives using our secure email form. One of our representatives will review your account to address your questions. Filling out the secure form allows us to safely contact you about your personal account information. Please allow five to seven business days for a response. For most retirement plans, there is no early age reduction if you retire when you reach age 62. But, in order to get you the account-specific information you need, please email our customer service representatives using our secure email form, and one of our representatives can review your account to address your questions. Filling out the secure form allows us to safely contact you about your personal account information. Please allow five to seven business days for a response. You can also read more about your plan on our publications page. I will have 30 years service in July 2018, however, I will not turn 55 until November. Can I leave my job in August and put my retirement papers in for November without penalty? If you are referring to the early-age pension benefit reduction covered in our blog post, then yes you can. Once you have 30 years of service, your pension would not be reduced regardless of whether you retire directly from employment or not. However, there are other benefits that could be affected if you go off payroll before retiring, such as death benefits and health insurance benefits. We recommend that you contact your health benefits administrator to find out how your health insurance would be affected. We also recommend that you contact our customer service representatives for account-specific details on how your pension would be affected. You can call them at 1-866-805-0990. You can also email them using our secure email form. Filling out the secure form allows us to safely contact you about your personal account information. Please allow five to seven business days for a response.